Keeping sight word practice fresh is crucial to keeping your child interested long enough to learn them! We’ve compiled a list of our favourite sight word activities, games and ideas. If you have any sight word ideas that work for your child, we’d love to hear about them at in the comment section below! Remember, generally speaking, you should be working from a list of approximately 13-14 sight words at ones: 10 known and 3-4 unknown. This is your child’s ‘working list‘. Sight word activities for parents and teachers! 1. Hide and Seek! Hide the sight words around the house. Have a list of the words so your child can check them off as they find them. 2. Search for sight words in a magazine. Keep a tally of how many times they are found. 3. 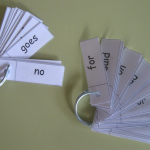 Attach sight words to a key ring that can be kept in your child’s pocket. 4. Word Chains. Have your child write the words onto small strips of paper. Then tape them together to form a chain. 5. Enter the sight words into wordle. Print and display the end product. 6. Hopscotch- use chalk to write different words in the boxes. Call out the words as you hop! 7. Draw a ladder and put a word on each step. Your child sees how far he/she can climb the ladder by reading the words without ‘slipping’. 8. Stepping Stones. Scatter sight word cards on the floor. Step on a sight word and say the word. 9. Sight Word sentence cards. Have your child make a new sentence and read. For extra practice, have them write down the sentence. 10. What’s Missing? Place 6 sight words in front of your child. Ask your child to have a good look. They then close their eyes while you take 2 words away. Can they work out what’s missing? 11. Swatting flies- lay sight word cards on the floor and when you call a word, your child must ‘swat’ it as fast as they can! 12. 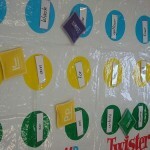 Twister with a sight word twist! Add sight word cards to the colours, change the spinner and you’ve got a game they will love to play. 13. Attach sight word cards to plastic cups. Take a water gun, call out the name of the target before shooting and off you go. 14. Play hangman using sight words. 15. Make up bingo boards with sight words. What will the prize be for the first to call ‘BINGO!’? 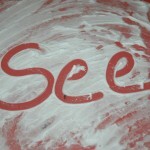 17.Shaving cream sight words. Your child will love writing their words using their finger! 18. Make a word search. Type the sight words into an online word search maker such as puzzle maker, print and let you child colour in all the words they can find. 19. Print sight words on paper plates (or just onto card) and attached them around the house- bedroom doors, mirrors, toilet doors! 21. Fill a soft drink bottle with sand and toss in small laminated sight word cards. Put the lid on and have fun with your child shaking it about trying to ‘discover’ the hidden sight words. 22. Print and display sight word ‘targets’ around the yard. Use a slingshot to hit each word! 23. Write sight words on ping pong balls. Toss, catch and say. 24. 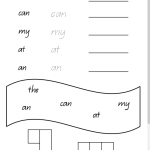 Sight word activity sheets. 25. Play Dough fun! Create sight words from play dough. 26. Fridge magnets. Arrange the letter magnets on the fridge into sight words. 27. Book hunt. Search through a book to find all the sight words. Arrange into different columns- 2 letter words, 3 letter, 4 letter, etc. 28. Write the words in the sand while at the beach. 29. Write the words in coloured chalk; the pavement outside works well. 30. Make a sight word dictionary. Write each letter at the top of the pages of a scrapbook. Each time a new word is introduced, have your child add the word to their dictionary. 31. Who am I? Have your child’s ‘working list’ displayed in front of them. Choose a word and have your child ask clues about it until they guess it. eg. “How many vowels does it have?”, “How many letters does it have?”, “Does it have a blend in it?”. 32. Play a game of dominoes with sight word cards. Place one card down. The next card to be placed down must begin with the same letter that the previous word ends with. 33. Stepping stones. Lay sight word cards on the floor, face up. Have your child step from one to the next, saying the word as they land! 34. Flashlight fun! Stick words from the ‘working list’ to the wall. Turn the lights off, take a flashlight and let your child go exploring for words! 35. Use a letter stencil to write sight words. 36. Play a game of snap using sight word cards (you will need 2 copies of each word). 38. Create a collage of sight words from words your child finds in magazines. 39. 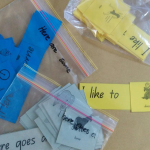 Sort the sight words under different headings. Eg. Number of letters, number of vowels, long vowel sounds/short vowel sounds. 40. Illustrate sight words in different ways. 41. Place the sight words in alphabetical order.